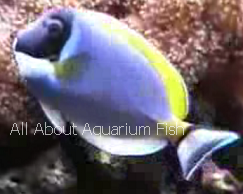 Powder Blue Tang is not the type of fish recommended for beginners to saltwater aquarium. The main reason why is because caring for the fish requires a lot of attention and the species can be very sensitive towards changes in terms of salinity and water temperature. Although there are different sizes of tangs sold in the pet store, one should not be tempted to buy and then try your luck hoping that they could live and survive in your home aquarium. Other than the water requirement, powder blue tang can also be very picky when it comes to its tank mates because they will often become territorial and aggressive over time. One of the main obstacles when it comes to addition of new tang fish to an aquarium is trying to make them adapt to the new environment. Although one can simulate the exact living condition just like the open sea, there is no such thing as being perfect. Even with an established reef system, which supplies natural food for your powder blue tang, the situation can sometimes be difficult to control and the fish will die without yourself understanding the causes. In certain cases the fish is also known to develop ich or white spot infestation on its body which is actually a result of stress and lower immune system when adjusting to new tank environment. Feeding your pet should be done with extreme care because you must understand what their diet is in the first place. Just like any other saltwater tang, they main food is usually algae which is found in abundance among corals and live rocks. Therefore, without an aquarium system that already has an established supply of the fish’s natural food, it can actually mean starving your pet to death. Some aquarist will actually provide and feed their powder blue tang with marine algae wafer but the benefit that comes from using the dried source will mean that your fish will not get all the benefits that only natural food has. Note that whatever purchased fish flake that you intend to give to them should only be considered as secondary supplement and never be used as their main diet. Since the fish is very sensitive to changes, an ideal aquarium setup should have all the basic equipment in place to prevent shock and extreme undesirable condition. Other than having protein skimmer or external power filter with bio-balls for natural biological filtration, it is also beneficial to have an externally equipped water storage tank as a standby to immediately change the saltwater if there’s any problem detected with regards to fluctuating ammonia or nitrate levels. Therefore, I always believe it is good to be prepared for any eventualities. 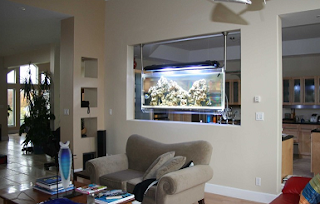 Create the stunning look of a perfect living room by having a wall hanging fish tank.